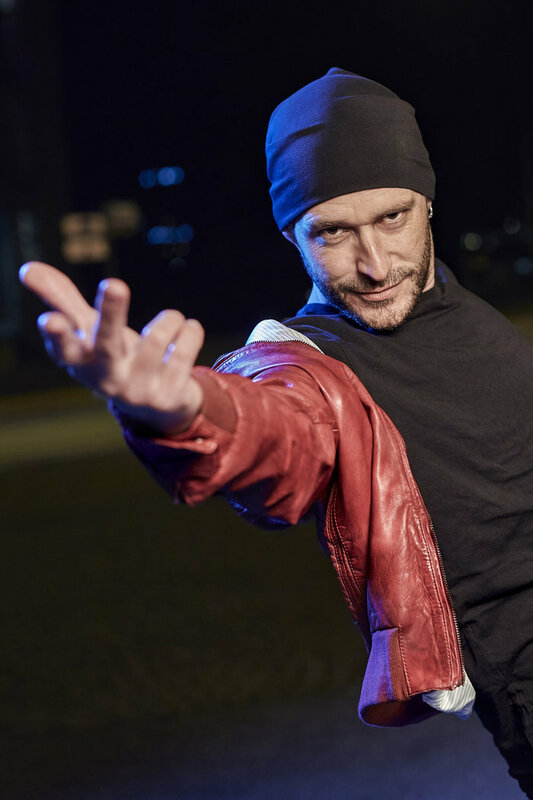 Andreas Schaerer "The Big Wig"
With the release of the album "The Big Wig", ACT welcomes the Swiss singer and composer Andreas Schaerer to its "Family Of Artists". Andreas Schaerer, from Berne in Switzerland, is currently one of the most talked-about vocal artists on the international music scene, and with good reason. He was awarded the title of International Vocalist of the Year at the 2015 ECHO Jazz Awards (in the year immediately following Gregory Porter), but he is considerably more than just a singer - and to classify him under jazz doesn’t really do him justice either. Schaerer uses his voice in the manner of a juggler, a magician. He can not only make it sound forth in contrasting stylistic idioms and vocal registers, (switching at will from songster to crooner to scatter), he can also produce all kinds of sounds and imitate a whole range of instruments. He can do beatbox percussion, or he can stack up polyphonic vocal parts on top of each other in a way which seems unfeasible. In addition to all that, he is also a hugely impressive composer and improviser, skills which he can bring to bear on all kinds of musical projects, where his virtuosity can be the key ingredient, either providing melodic form or rhythmic impetus. And his skills don’t stop there. He has considerable on-stage charisma, and also brings a rare gift into the world of ‘serious’ music: humour, which is the stock-in-trade of his main band Hildegard Lernt Fliegen (meaning Hildegard learns to fly). 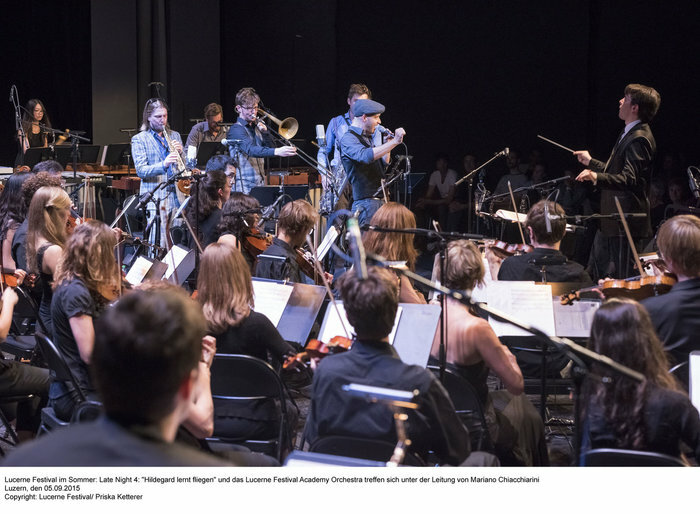 It was therefore a logical step, when the Lucerne Festival, with its unparalleled renown in the world of classical music chose “humour” as its theme for 2015, that it should approach Schaerer and Hildegard Lernt Fliegen. 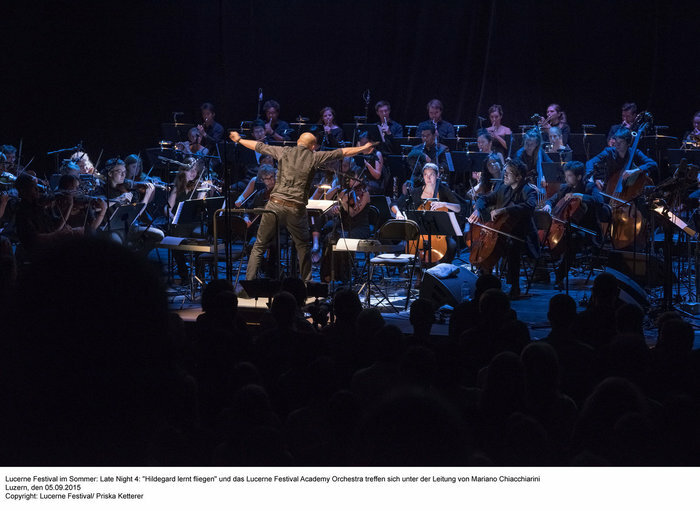 The festival’s head of Contemporary Projects Mark Sattler asked Schaerer if he might combine a new composition for the Lucerne Festival Academy Orchestra with a 20-minute appearance by Hildegard Lernt Fliegen. Schaerer didn’t just grab this opportunity, he really ran with it. What he composed was a six-movement orchestral work, with parts for 66 players. 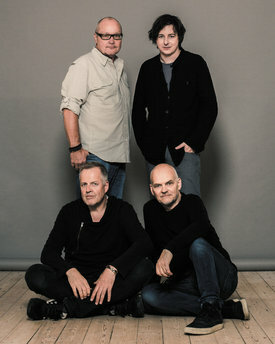 He put himself through the hard graft of composing and arranging, then through the intricacies of orchestrating and part-writing, followed by an intensive rehearsal process… as a result of which “The Big Wig” had its public premiere on 5th September 2015 in the magnificent Jean Nouvel-designed Culture and Convention Center in Lucerne. This work had the audience leaping from its seats. Even the Swiss press, normally known for its sangfroid, turned ecstatic. The cultural magazine KultUrteil concluded that only one adjective would suffice to describe the work: “gigantic.” While the Neue Luzerner Zeitung remarked: “what was crazy about this piece was how the complexity in the orchestral writing combined with grooves, something more or less unknown in contemporary music.” Fortunately, Swiss Radio (SRF) had arranged to made a recording of the premiere, and there was also a camera team on hand to film it. 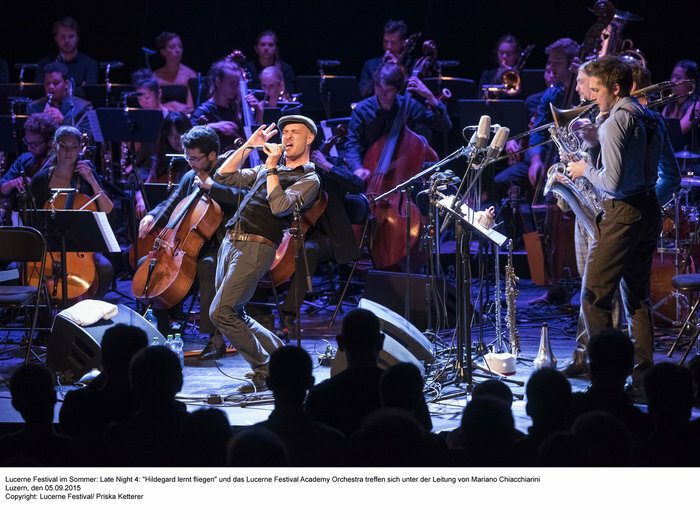 So this extraordinary concert has been documented both as a CD and a DVD: Andreas Schaerer “The Big Wig” - Hildegard Lernt Fliegen meets the Orchestra of the LUCERNE FESTIVAL ACADEMY. There is a paradox here, however. The Festival’s theme of ‘humour’ has in fact produced in “The Big Wig” the most ‘serious’ appearance by Schaerer there has ever been. Such was Schaerer’s keenness to exploit all the possibilities of working with a symphony orchestra, it was almost inevitable as a consequence that he and his fellow band members would become another limb, bring an additional dimension to the whole orchestral sound and experience. That is certainly what happens with the three adapted and extended Hildegard compositions “Zeusler”, “Seven Oaks” and “Don Clemenza”. In this context they acquire a new flow and momentum, and a power akin to the cinematic. Maurice Ravel and Leonard Bernstein come to mind, as do Duke Ellington or Stan Kenton. The rhythmically displaced staccato figures in “Don Clemenza” even have an echo of Stravinsky. Taking the newly composed original pieces such as “If Two Colossus”, “Wig Alert” und “Preludium”, what they convey is inspired symphonic writing combined with both wit and a wish to experiment which remains accessible to the listener. These are aspects that are mostly absent from typical new contemporary classical works. The young and prodigiously talented young musicians of the orchestra, drawn from all over the world inevitably spend time outside the classical music ‘bubble’. On this recording it is clearly to be heard how much fun they are having, as they form into a relaxed, yet precisely co-ordinated ensemble under the direction of conductor Mariano Chiacchiarini. And when Schaerer himself takes the conductor’s rostrum, as happens briefly in “If Two Colossus”, they all embark whole-heartedly in the direction of jazz. Has a symphony orchestra ever been heard in a collective improvisation that is quite this lively and this thrilling? There have been plenty of occasions in the past when combinations of a symphony orchestra and a jazz combo turned out to be a car crashes. In this case the partnership turns out to be both stimulating and compelling. There is no activity which is in the background or subsidiary, every instrumental voice is at the heart of the action, including the pairs of harps and marimbas. This is symphonic music of a new kind. It doesn’t so much pass through genre boundaries; it no longer perceives them or acknowledges their existence. “The Big Wig” is a masterpiece by the multi-talented vocal marvel Andreas Schaerer. This is a work which situates him quite clearly and definitively among the most important composers and interpreters of contemporary music of his generation.